When hitting the road on your motorcycle for that long journey there's no better brand to trust in motorcycle tires than Dunlop. Dunlop's long term experience in manufacturing street bike motorcycle tires allows them to provide a superior motorcycle tire that you can trust to get you there and back. Only replacement motorcycle tire for Harley-Davidson® motorcycles which is designed in America, tested in America and made in America. All new Dunlop American Elite replacement tire line ensures that industry-leading Dunlop Tires will be on your Harley-Davidson® motorcycles for years to come. Dunlop's decades-long engineering experience with Harley-Davidson® motorcycles is the foundation for the all-new American Elite line of replacement tires. All-new tread design provides even tread wear and quiet operation in all conditions wet and dry. Sidewall design proudly features the American Elite name and made in the USA logo. This is my second Elite. I've gotten 3,000 more miles on this tire than previous tires. So far the best tire on my 03 Heritage Softail. I run American elite tires on my 2009 FLHTCU and I like them way better than the chicken foot pattern OEM tires that came stock on the HD. I get better mileage and less tire noise when the tire gets older, because of less scalloping wear on the American elite tires. Dunlop did a lot of research on this tire and it shows. I have ran every tire possible looking for performance, lots of miles, traction in every condition and this tire is the best. Do not hesitate to buy this tire. Good traction on wet or dry roads. I’m not sure on the mileage it will get on the Vulcan 1500cc but on my Honda Stateline it’s up to around 8K miles. Great tire wears like original equipment. Same.tire for Harley's except no bar and shield. This is the second set I've bought. The price is right, shipping was fast and a rebate doesn't hurt either. I put them on my 2016 Street Glide and fit is excellent. I don't know about getting 20k out of them but 15k is ok with me. I drive all year and in all weather and I am very happy with them. Grips super well rides real level on bit roads just smooth. When u warm up the edges they stick super well in turns haven’t broke traction yet. Was not aware that the actual white wall was raised up off the tire and had to install axel shines and sprocket shims to keep white wall from rubbing belt. Great tire, I need to get more miles on it before I can do a more thorough review. Hands down better than the 880 I previously had. Awesome tire. I would recommend it. Love it! Looks great and handles amazing. Highly recommend. It always seems like my rear tire needs to be replaced. I always ride two up and by the time my tires get around 10,000 miles I probably should replace them but are usually try to milk and extra for 5000 because they are so expensive. At least these American elite's seem to get around 15,000. A number of my friends have tried car tires because of the fact that motorcycle tires don't last long enough for their taste. Well I won't go that route but of all the motorcycle tires I've tried these American elite's, at least when they are new really ride and handle well. I love taking corners with them when they're new. This is my third set of these. I really like the way the bike handles with these. Great mileage too. This last set was the best. Just shy of 20,000 miles. And this is on a big Electra Glide Limited. 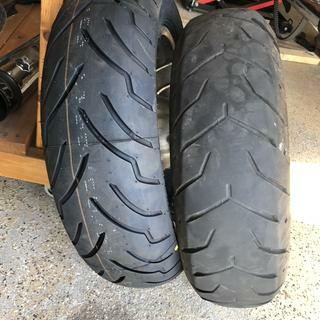 I ride a 2009 H-D Ultra Classic with 122,000 miles and have used this Dunlop tire throughout. I check my tire pressure every 2-3 weeks and keep it at the max. pressure recommend on the side wall. I also participate in a performance mc drill team, which tests the grip ability to the max. All that and I still get an amazing 25,000 miles out of the rear tire. I had this put on my '03 FXDWG and it is performing very well. In tight twisties, where I would drag pegs, there was no indication the tire was at its limits. Great tires this is my second set and I got 15,000 miles out of last set. 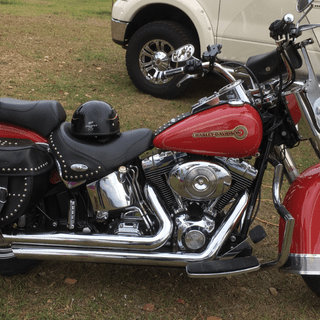 Best all around tire I have used and I go thru tires really quick, I get twice the miles out of the American Elite tires some times over 20 thousand miles, I have 2 Harleys and my softail has 89k and my electra glide has 50k on them, I ride. !! Just like my review of my front tire. I buy in pairs and always from here. Fast shipping!!! A great tire all around! Have ran every brand out there and these are always the best in tread life and mileage. I recommend them to everyone. always heard good reviews on these tires so i thought i would try one. only have about 800 miles on it so far but am very pleased with the ride and traction. Excellent tire and works great on my Harley. I race Harley's and wrench on all of my own motorcycles. Bye far this is the best tire at the best price. I go through around 30 -40 a year on my team bikes. RM has been my vendor for years and will continue to be for years to come. Keep up the excellent work and thank you Rm. 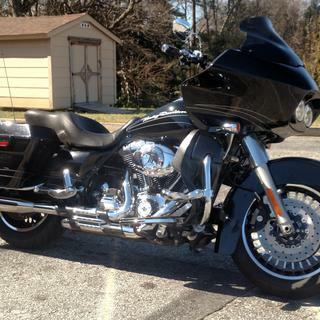 -m-2016 HARLEY-DAVIDSON® Road Glide Ultra FLTRU 23,560 miles in 15 month love this bike. Second set I've purchased from rocky Mountain atv/mc, best price you'll find, Received in three days. Milage 13,000 plus now on front and rear almost to wear bar on rear . Will buy again from RMATV/MC.. Seems to grip well, although I can't say I've tried to push it beyond its grip... I think I have about 7,000 miles on the tire and it is just starting to flatten out in shape. I feel good about buying this Made In America product and supporting the vanishing middle class. Handling very well and I get 9K miles on this tire. I have been running these tires for years and have been very happy with them. Be sure to wash the blueing off the tire before you have it mounted mine has dark brown streaks in the wide White wall. I found this after mounting. Too late to exchange. I tried every tire cleaner out there none worked. Had to use White paint marker to help cover it. Good tire so far. First time I've used this brand. No problems yet. Have ran Avons, Commander 2s. These tire are stronger and last long. Third set. Got 16,600 out of one set just highway Riding. I have tried different tires on my Street Glide but get the best wear and Mileage out of the American Elite by Dunlop! Smooth riding and easy cornering when dry. A little slip when wet and oily, but no worse than OEM. Far better dry ride and handling than OEM. 4000miles so far off TX roads and still at 6/32"
Is the thread pattern on American elite tires compatible with dunlop D402 series? 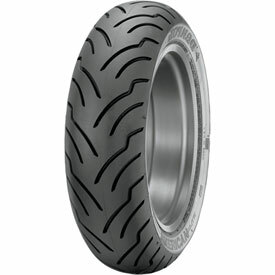 BEST ANSWER: First, I did not know Dunlop is now making the American elite rear tire for the older (pre-2009) H-D. 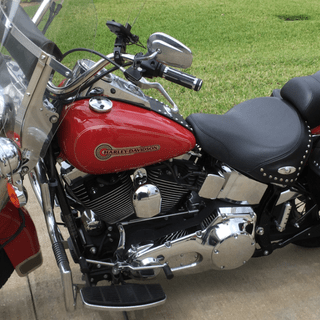 I can only tell you, I run American elite tires on my 2009 FLHTCU and I like them way better than the chicken foot pattern OEM tires that come stock on the HD. I get better mileage, and less tire noise when the tire gets older, because of less scaloping wear on the American elite tires. This explaines compairable, not Compatiable, so let me say this, if you mean "Compaitible" by mixing the tire patterns it may have an adverse effect for the following: ABS braking, tire to road reaction in turns, scarified road surfaces, and steel deck grated bridges, so I would advis not to mix tire pattterns, if that is what you mean by Compatiable. RM. No. It is a more aggressive tread pattern. Although I have run a 402 on the front when I replaced my rear, I soon learn it would handle MUCH better if I replace the 402 and I was right. With the American Elite on front and rear the bike handles like a dream. Amazing tire. Tread pattern? Im assuming thats what you meant. They look different if thats what youre asking. Could you run them together? Certainly. Its not that big of difference in appearance. It is always better to have a mach pair but a lot of bikers will put more expensive, long lasting tires on the back and cheaper on the front. What is the maximum and recommended tire pressure? BEST ANSWER: Maximum pressure will be 42 psi. The recommended will be up to you, but typically you should ignore the manuals pressure guide and use the tires max for best tread life. Lower than max will give a slightly softer ride but can dramatically shorten tread life. The tire pressure is 40 psi for normal riding. When traveling with the bike with another person on it with some luggage the tire psi is 45. 42 psi max. Recommend 40 psi. I would not exceed 40 psi. Is there an American Elite rear tire that is the equivalent of a 140 width? I can’t fit a 150, and don’t like running a 130. BEST ANSWER: It would help to know more. ie bike it’s going on and what size rim.